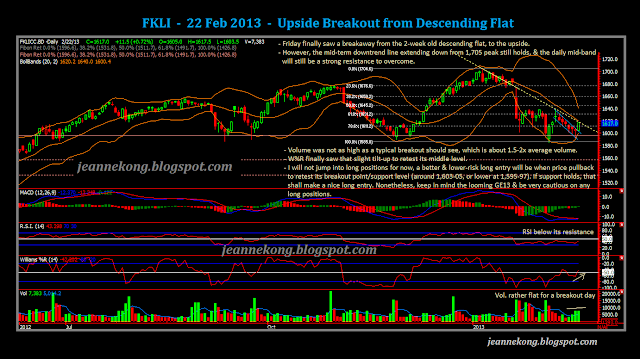 As if hearing my impatience, FKLI finally had an upside breakout from the 2-week descending flat. With the 2 trendlines defining the descending flat plotted on the daily, its more than obvious since the opening that an upside breakout has occurred. I really like this quote from George Soros, one of the trader figure I like most.
" It's not whether you're right or wrong, but how much money you make when you're right and how much you lose when you're wrong. " So, I was right about the imminent breakout. 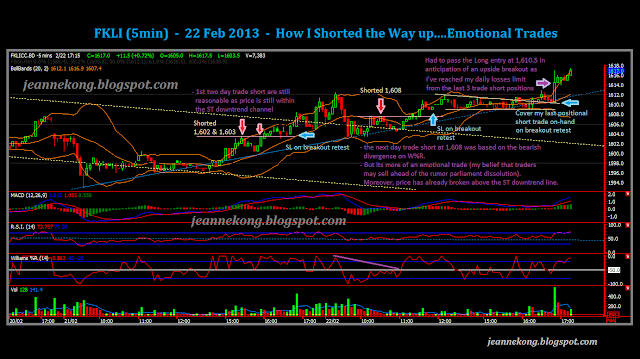 But I was losing money on day trades this Fri (Feb 22). In my previous posts, I repeatedly remind myself & readers to be cautious & do not get carried away by the shorting frenzy from election jitters. 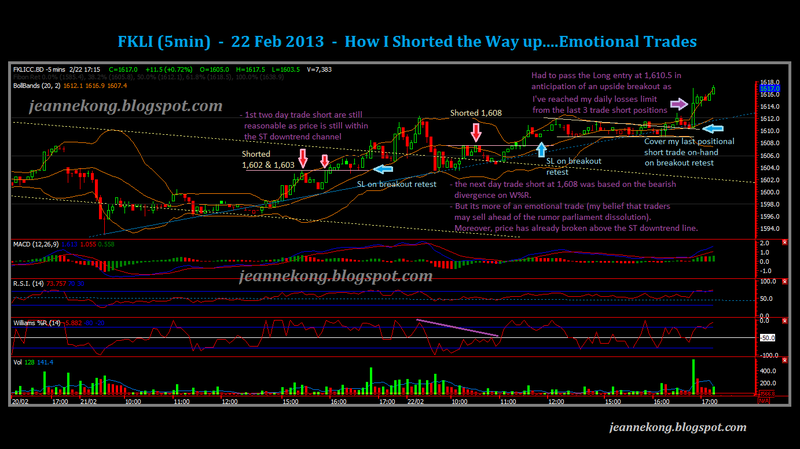 Nonetheless, as crazy as it sounds, I myself fell into the trap of shorting on rumor, or whatever it was. I was basically shorting my way up throughout Friday's session, somehow. Looking back, it was almost impossible to explain why I did what I did, with my day trades looking totally unreasonable & unprofessional. 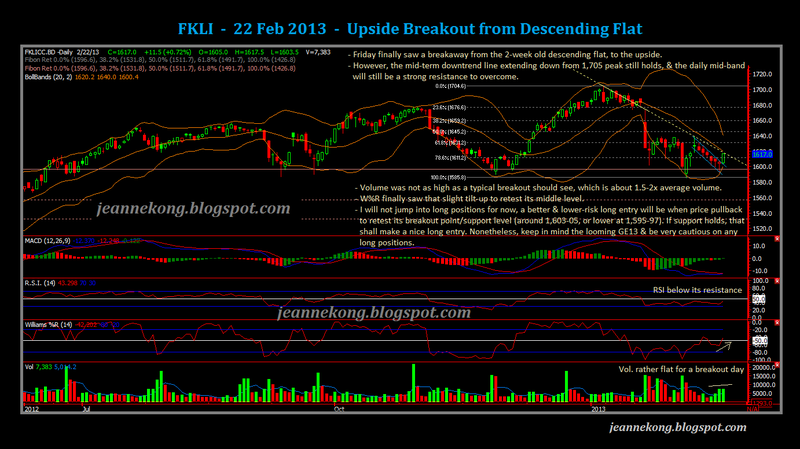 I did up a 5min chart on FKLI to record my out-of-mind trades on Feb 22. The losses was in control, but the fact that I was shorting on an obvious ST uptrend, with the knowledge of a potential upside breakout happening on the daily, it was devastating to my confidence & state of mind. The last straw that utterly breaks me was the fact that, when an almost perfect setup for an upside breakout occurred in the last minutes of trading, I had already reached my daily losses limit & was not able to take advantage of it. As a full-time trader, the last thing one should do is to trade emotionally, not to mention totally against the initial trading plan. Its not just unprofessional, but it's also suicidal. You'd find yourself not only made unnecessary losses, but also missed the real opportunity that comes by. I share this experience here to remind myself to always be in my clear mind if I was to trade. Also, I hope this can be a real-life exemplary lessons all readers can take heed from. I have spent the whole Saturday reflecting on my past trades & clearing my mind. The ability to separate your personal life from your professional work is ultimately important, even more so when you are in the trading business. Friday's upside breakout from the descending flat shows that bulls are now on head-to-head tussle with the bears. I have cleared all my positional shorts prior to the last-minute breakout. I personally think we should see the breakout as a signal to take profit on accumulated shorts on-hand, rather than rushing into long positions. A typical breakout like the one we are experiencing will always be followed by a fast pullback to retest the breakout point or any support levels to its proximity. A swing/positional Long entry shall only be when the support/breakout level holds during the retest. CPO started out on a bullish note on Friday morning, but late evening selling saw it close flat at opening price of 2,532, forming an inverted crucifix doji, sitting on the daily uptrend channel (lower line). Although the daily uptrend channel still holds, there's an inevitable sign of weakness among the bulls. Shorter time frame charts paint a more bearish picture than the daily suggest. There's a potential of a retest on latest pivot low of 2,476, based on price projection on the hourly & 15min. Another catalyst for a potential breakdown of CPO price comes from the bearishness in SoyOil price. 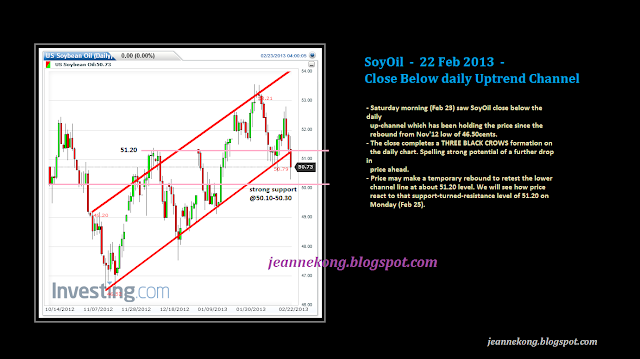 On the daily, SoyOil formed a three black crows bearish candlestick pattern, coupled with a close below the daily uptrend channel on Sat (Feb 23) morning. This may add to the bearishness on CPO price when it opens on Monday. 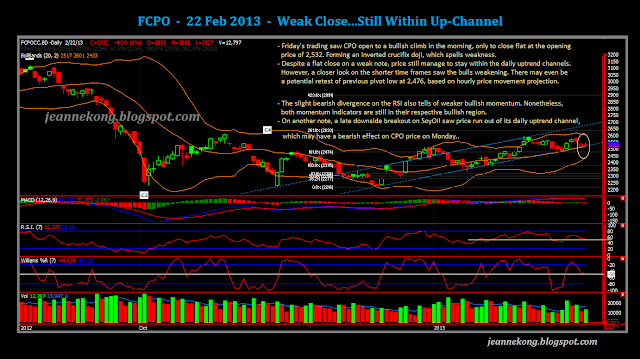 We shall see if price is able to close on a higher note on Monday, if a lower open did occur. 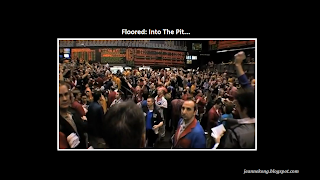 Share a movie on how Chicago floor traders saw the glorious of their floor trading days loses its sparkles when computer trading came into scene. That's about all for the closing of Week 3, Feb'13. No news on any parliamentary dissolution, yet. Rumors are still rumors. Let's keep a clear mind. Stay on top of your game! !